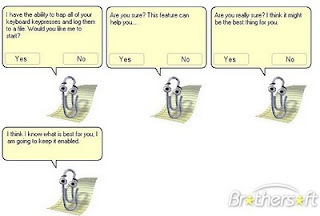 The Office assistant was enabled by default in early Microsoft Office versions. It popped up when the program determined the user could be assisted with using Office wizards, searching help, or advising users on using Office features more effectively. It presented tips and keyboard shortcuts. 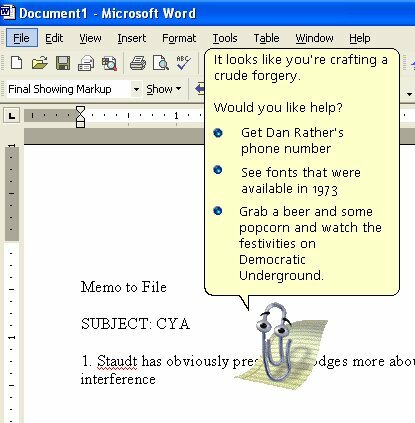 For example, typing an address followed by "Dear" would cause Clippit to pop up and say, "It looks like you're writing a letter. Would you like help?" Clippy giving important advices to users. 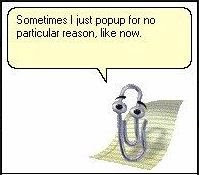 Sometimes it gets so bizarre that user gets frustrates by frequent pop-ups of Clippit.MS realized this much later and eventually replaced it. 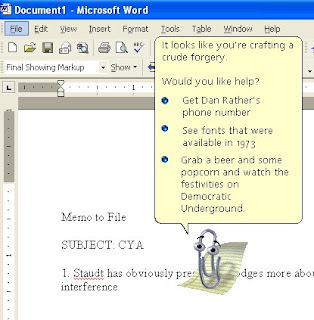 As of Office 2007/2008, Microsoft replaced the Office assistant with a new online help system. What remains now are sad memories of our beloved friend! He has been a close friend of mine. Right from his childhood till his old age I have always remembered him at times of crises. We laughed, cried, quarreled, and eyed on the same girl in college. After graduation, he got employed in Microsoft and spent the rest of his life servicing the software kingpin. I remember one day, I had a very furious quarrel with my Girlfriend. (Don't ask me to disclose her name..) I was very tensed, had no one to seek an advice. 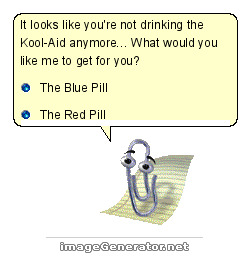 Then I remembered my old buddy Clippy. I remember I called him at midnight, and he didn't mind it. Within minutes he solved my problem and we again patched up. member when he got fired from Microsoft under heavy criticism, he attempted to suicide. He was a great advisor and a philosopher. 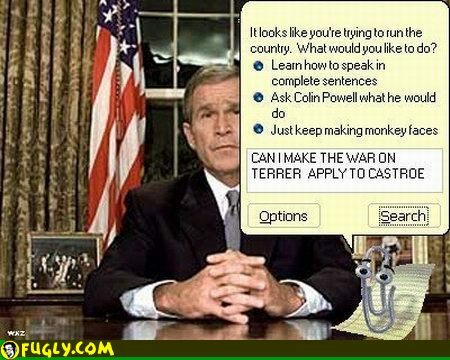 His client list included president Bush. 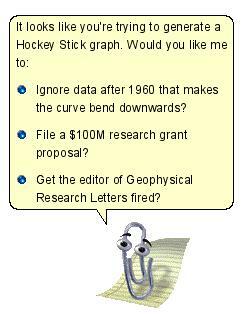 Clippy advising Bush on serious administrative matters. Now that he is gone I pray to God that may his soul rest in peace. No one can fill the void in my Laptop that his absence has created. Reacher says that Clippy greatly improved workplace productivity. 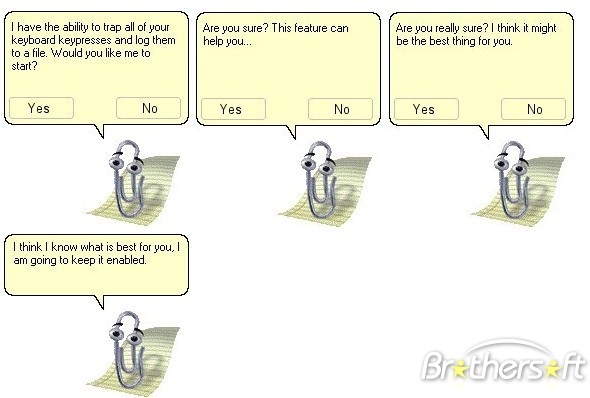 Clippy advising another dumb user, just like you. 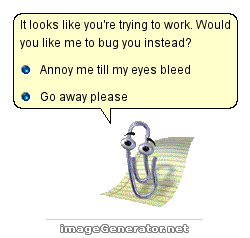 Yeah, I help you to work..
One of the sources of revenue for Clippy. 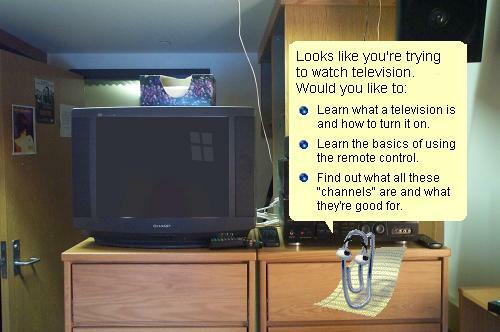 Clippy being used by a new Family who recently bought TV. 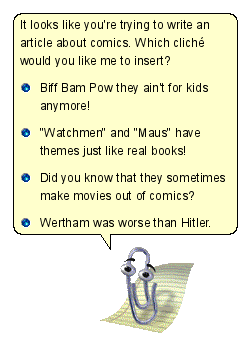 Most Hollywood Directors including James Cameron took story plots from Clippy. 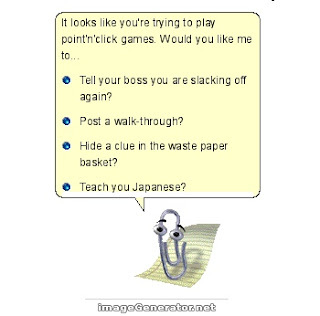 In first place Clippy never admired MS for its ethics. 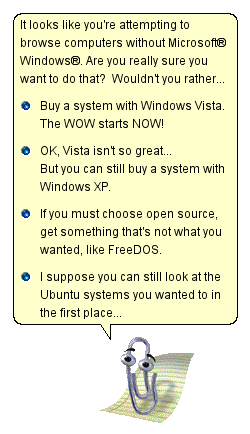 He always wanted to be Open Sourced. Yes, that is what MS calls a Support system!